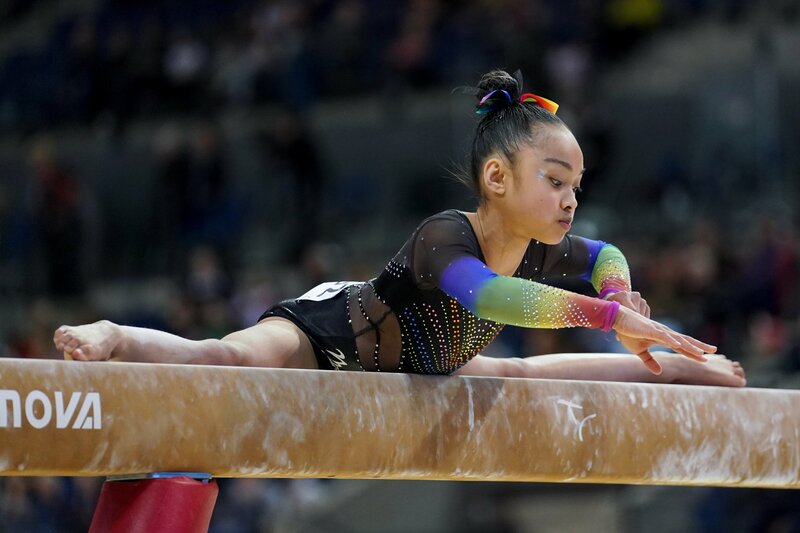 Wales’ young female artistic gymnasts dominated the competition at the British Championships in Liverpool, with the Welsh female Espoir (under 13s) gymnasts taking eight of the top ten spots in the all-around competition and winning gold in every individual apparatus contest. Jacob Edwards of Olympus Gymnastics Club in Wrexham won all-around gold in the under 16s men’s artistic competition, while Jea Brittany Maracha scooped gold in women’s the Espoir (under 13s) all-around competition. Jea who competes for Clwb Cymru Caerdydd and also lives in Cardiff was crowned champion, with Wrexham’s Mia Evans, who now competes for Park Wrekin Gymnastics Club, taking silver. Poppy Stickler, also of Clwb Cymru Caerdydd and who also lives in Cardiff ,won bronze. Jea also won individual gold on beam, Mia took home the individual gold on floor and silver on vault. Other Espoir individual medal winners were Annais Muteba of Cardiff Central Youth Club, who won gold on vault, Meliyah Baker who won silver on beam, and Ruby Evans and Sofia Micallef who won silver and bronze respectively on floor. When it came to the men’s junior artistic competitions, Wales again took a strong foothold in the competition. Jacob Edwards, who competes for Olympus Gymnastics Club and lives in Wrexham, was crowned the under 16s all-around champion and won gold on the floor and pommel horse. Penarth’s Alex Niscoveanu, who trains with South Essex Gymnastics Club, won the bronze in the under 14s all-around men’s competition, winning individual silver on the high bar and rings andbronze on the floor. In the men’s senior competition, Josh Cook of Barry YMCA won individual silver on the high bar in the Masters’ Apparatus Final. Ann Bevan, Welsh Gymnastics’ CEO, said of the results: “It was an amazing weekend for our junior competitors, with our younger gymnasts dominating both the men and women’s junior contests. “The strength of their performances demonstrates how much hard work they have put in to achieve their sporting goals. They all performed amazingly well and really did their coaches, clubs, their sport and their countries proud.